The most powerful standard car Volvo had ever produced, the Volvo 164 E, was presented. The engine had electronic fuel injection and developed 175 hp. A new version of the P1800 was also introduced in 1971. The accentuated fastback profile underlined the sporty nature of the car. This model was known as the P1800 ES. In 1972 Volvo presented a safety vehicle, the VESC (Volvo Experimental Safety Car), an experimental car but also one that looked towards the future. New generations of Volvo cars was presented in 1975, the Volvo 240 with six different models and the Volvo 260 with two models. These cars had a new front, inspired by the VESC, and the dashboard modified. The 240 Series was equipped with a new B21 engine with an overhead camshaft. The 260 Series also had a new engine, a V6. The new 6-cylinder engine was the first result of Volvo's joint venture with Renault and Peugeot for the development of car engines. The Volvo 343 (later 440) from Holland made its appearance in 1976. This was a completely newly developed car from Volvo. With the 343, Volvo took up the gauntlet on the tough but growing market for mid-range cars. The first model was equipped with a 1.4-liter engine and continuously variable transmission. Volvo celebrated its 50th anniversary in 1977 and commemorated the occasion with a limited edition 244 and 264 model, called Jubilee. Those cars had silver metallic paintwork with special black and gold decor moldings and blue velour/plush seats. The Volvo 262C Bertone was also presented during the year. The first turbocharged car from the Volvo Car Corporation! The Volvo 240 Turbo with a B21 ET engine developing 155 hp was a true performance model with the sort of driving characteristics people expect of a sports car. On February 25th, 1981, the one-millionth Volvo bound for North America left the assembly line at the plant in Gothenburg. This Jubilee car was a silver 240 Estate. Volvo was now the largest European car exporter to the US. On February 1982, Volvo unveiled its new model, the Volvo 760 GLE. The 760 was introduced with two different engines, the 6-cylinder B28E gas engine and a new turbocharged 6-cylinder diesel. With the Diesel engine, the Volvo 760 GLE accelerated from zero to 100 Km/h in 13 seconds, which made it one of the world's fastest diesel-powered cars. The Volvo 780, a new exclusive 2-door model developed in collaboration with Carrozzeria Bertone in Turin in Italy, was presented at the Geneva Motor Show. Volvo Car B.V. from Holland introduced the Volvo 480 ES with sporty styling and the first front wheel driven Volvo. In 1986, engines with catalytic converters and the Lambda Sond were introduced in a number of European countries (Volvos exported to US had had that since 1977). In 1989, Nils Bohlin, designer of the three-point safety belt, was elected to the American Safety and Health Hall of Fame, and the mechanical safety belt tensioner earned the Prince Michael Road Safety Award. In the autumn of 1990, Volvo presented the 940/960. The Volvo 960 had a newly developed driveline with an in-line, six-cylinder, three-liter engine and an electronically controlled automatic transmission. The new engine meant that Volvo was able to advance its position in the high-performance sector. A unique and practical integrated child booster cushion was also presented as an alternative to the conventional armrest. The Volvo Car Corporation received yet more distinctions for its work on safety, in the form of the Prince Michael Road Safety Award for the best technical innovation in the field of safety and the Auto car & Motor award for the best safety feature. Both awards were for the integrated child booster cushion in the Volvo 940/960. In June 1991, the Volvo Car Corporation unveiled a completely new car, the Volvo 850 GLT, The Volvo 850 GLT represents Volvo's greatest industrial project over the years. The Volvo 850 was also the first car in the world to be fitted with a side airbag to supplement the structural side-impact protection system (SIPS). Since its introduction in 1991, the Volvo 850 has earned more than 40 international awards. One of the most coveted ones in 1994 was the Good Design Grand Prize, presented by MITI (the Ministry of Trade and Industry in Japan). 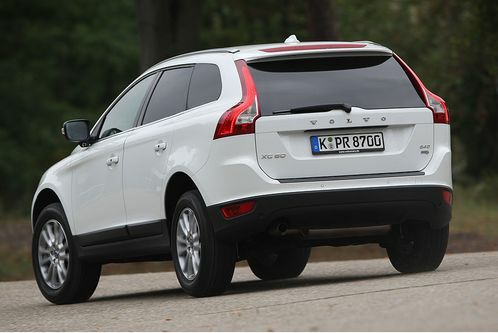 The high safety level of Volvo cars was confirmed once again during the year. Two Americansurveys done by the Insurance Institute for Highway Safety and the Highway Loss Data Institute, cited Volvo as the safest car on the market. Volvo's most powerful car, the 850 T-5R with a five-cylinder, 250 Hp turbo engine was presented at the Geneva Car Show in 1994. 1996 brought a number of exciting new models as a result of Volvo's dynamic product strategy, including the Volvo S70 sedan, the station wagon V70 and the Volvo 850 Bi-Fuel. It was fitted with twin fuel systems, allowing it to be driven on either petrol or methane gas. This meant that it already satisfied the California emission legislation for the year 2000. Production of the Volvo S40 and V40 got fully under way but it would take several more years before the model found its way to America. Sporty, elegant, exciting. All these words were used to describe the new luxury model, the Volvo C70 coupe when it was unveiled at the Paris Motor Show. The C70 was the first car to emerge from the joint venture with the British engineering firm TWR at Auto Nova’s Uddevalla Plant. An open version, the C70 convertible followed at the end of the year. This is the first open Volvo since the P1900 in 1956. The introduction of the new Volvo S80 at the end of May 1998 was without a doubt the climax of the year. In late spring and summer, the new challenger on the saloon market was driven by motor journalists from all over the world, and their reviews were very enthusiastic. After one year, the new Volvo S80 had already earned a number of awards, including the Prince Michael Road Safety Award for the Inflatable Curtain. It was also acclaimed "the Most Beautiful Car in the World" by the Italian motoring organization and magazine Automobilia. These awards emphasize the fact that the Volvo S80 is a typical Volvo, particularly in terms of safety, quality, reliability and environmental awareness. New inventions include the revolutionary Multiplex electrical system that uses two main cables, twenty or so computers and digital technology for its communications network. The result is less wiring, increased capacity, better reliability and easier retrofitting of extra equipment. PremAir, a catalytic coating for car radiators that converts potentially harmful ozone in the air outside the car into oxygen. The 8th of Mars 1999, a dark day for puritan Swedes but good for Volvo. The car company was sold to American Ford Motor Company. The new millennium starts very well for Volvo Cars. In 2000, the company sells 422,100 vehicles, a record year, and Volvo S60 sees the light. The new sporty compact saloon model is extremely well received by both the press and car buyers. Volvo has produced concept test platforms through the years and the VSCC (Volvo Safety Concept Car) of the new Century is one of them. Emphasizing on high visibility and safety, using see-through roof pillars and 4-point seat belts. In 2002, the long awaited Volvo SUV XC90 is released in America. PCC2 (Performance Concept Car) has a 300 hp, 2.4-litre turbo engine producing a mammoth 400 Nm of torque, with a 6 speed gearbox. The next major milestone Ford sells Volvo to Geely, a Chinese multinational automotive manufacturing company. The “Classics” 544, 122 and 1800Volvo began exporting cars to the U.S. in the late ‘50s. The PV series for “person vagen” or 444 as they were known here, were available as early as 1957. These early models are easily identified by their split windshield. In the early ‘60s, the 444 received a few upgrades and became known as the 544, the first popular Volvo in the states. Among the upgrades was the new B-18 engine, 12 volt electrical system and one-piece windshield. The 544 is sometimes affectionately referred to as the “Humpback Volvo”. The early B-14 and B-16 powered models are probably not good candidates for daily drivers as engine parts are difficult to get. The B-18 powered version starting in 1962 is a more logical candidate as engine parts are still in somewhat decent supply. Next came the 122S or “Amazon” as it is known in Europe. The 122 was first available in 1961 and sold in the U.S. through 1968. It was available in 2-door, 4-door and wagon versions; all badged 122S. 1961 models had 4-wheel drum brakes and the less desirable B-16 engine. 1962 to ‘66 models use a rear suspension that is O.K. for normal driving. If you plan to beef up the engine or drive “spirited,” you’d be better off with the more robust design used in the 1967-’68 models. Surprisingly, not much changed in the eight years the 122 was offered here; the engine, interior and exterior went unchanged with the exception of the grille. 1967 models seem to be very plentiful for some reason and are sought after for restoration. The 1800 or P1800 as it was known early on was introduced alongside the 122. The 1800 shared the drivetrain and suspension of the 122, but sported a swoopy Italian-inspired body and sportier interior. The development and manufacturing of the 1800 is an interesting story in itself, involving designers and manufacturers from the United States, England, Scotland, Italy, Germany and of course Sweden. The P1800 was originally assembled in England. The bodies were made in Scotland and then shipped to Jensen for assembly and finish. These models, 1961-63 (chassis number to 6000), were known as P1800 series. In 1963 when Volvo began assembling the cars, they became known as the 1800S. This continued through the 1969 model year. In 1970, fuel injection replaced the dual carbs and the 1800S became the 1800E. The 1800E was available from 1970 to 1972. The 1800ES (sport wagon) was available in 1972 and ‘73. The 1800 was popularized by its use in the 1960s TV show “The Saint” in which Roger Moore as Simon Templer a.k.a. ‘The Saint’ was often shown cruising in a white 1800. Because 1800s are sporty and somewhat rare, they are popular to restore. An 1800 in good condition can be a reliable and functional daily driver. The engines used in these classics can be identified as follows. Let’s look at B2OB. The first letter ‘B’ indicates benzine or gasoline; 20 is the displacement — 2 liters or 2000cc (a B18 is 1.8 liter or 1800 cc’s). The last letter indicates engine configuration: B equals dual carbs with standard compression ratio, E indicates fuel injection with high compression and F means fuel injection with low compression. This also applies to the B16B and B18B. These early engines were available only in dual carb versions in the U.S.. The B-16 can be identified by the canister style oil filter on the driver side of the engine and by the two studs protruding through the top of the valve cover used to secure the cover. B-18 and B-20 engines look very similar on the outside. However, B-20 is cast into the B-20 block just below the cylinder head at the front driver’s side of the engine. Meet the Boxy VolvosThe 140,160,240 and 260 series spanned 26 years of production from 1967 to 1993 and to many these are the “REAL VOLVOS." Badging Information: A new nomenclature and badging scheme was introduced to the U.S. in 1967 with the 140 series. The new badging was more descriptive than previous badging and could help to identify a particular model and how it was equipped. For instance, let’s take a look at the 144S as it was introduced in 1967. The first digit in the model designation 144S indicates the series of Volvo, the second digit, 4, indicates the number of cylinders of the engine and the last digit, 4, indicates the number of doors. The “S” designates carburetion; later models were available with Bosch fuel injection indicated by “E” as in 142E. Once you were privy to this little known piece of information, it became easy to identify the different models by their badging. For clarity, we’ll explain one more model breakdown. For this example, we’ll break down the 200 series with the popular 245 wagon. Once again, the first digit identifies the series, the second digit indicates that this model is equipped with a 4-cylinder engine and the last digit, 5, indicates that this is a 5-door or wagon model. Volvo stuck to this system pretty rigidly throughout the 140,160, 240 and 260 series. A few very rare 264s were equipped with 4-cylinder engines because of supply problems and some crazy marketing ideas in the late 80s gave us 240s badged “240” or simply DL or GL with no reference to the body style. Volvo has used DL and GL to indicate the trim level of these models from 1974 to 1990 and then inconsistently from 1991 until the end of introduction in 1993. In 1993. DL (De Luxe) indicates the base model with modest interiors and accessories where GL (Gran Luxe) indicates the higher level of trim. In general, the differences between DL and GL are as follows. DLs usually have vinyl interior, roll-up windows, manual adjust mirrors, steel wheels and black trim. Options on the DL such as air conditioning, cruise control, power windows, power door locks, power mirrors, leather or velour interior, AM-FM cassette and alloy wheels came standard on GL models. A few special models were spread over the life of these two series of Volvos. The 1971 142E was a favorite with its high output engine. The 242GT was available from 1978 to 1980 and offered a sporting version of the 240. The GT had special trim and interior treatment and suspension upgrades which gave noticeable improvements. The GT was replaced by the 240 GLT Turbo in 1981. It’s interesting to note that when the 240 Turbos were introduced in 1981, the wagon got the sporty turbo exterior trim package, turbo wheels and GLT badging, but no turbo! Inside the “Box”It’s also helpful to know a bit about available engines and transmissions, so we’ll cover the basics here. Due to limited space, we’ll briefly mention the pros and cons and what to look out for as we cover the drivetrain options. The 140 series was powered by a 1.8 or 2.0 liter over-head valve pushrod engine, known as the B-18 and B-20 respectively. The B-18 was replaced by the B-20 in 1969. The B-18 was offered here in the 140 in a dual carb version only, denoted by the B-18B suffix. The B-20 was available in several versions, starting with the B-20B, again the B suffix denoting dual carbs. In 1971, the high output B-20E was introduced. The “E” configuration denoted high compression and fuel injection. In 1972 the lower compression B-20F replaced the B20E and was used until the end of production in 1975. The B30 engine used in the 6-cylinder 164 followed a similar course. In 1975, Volvo introduced the ‘Evolutionary” 240, however the 1975 US model for some reason was burdened with the old B-20 engine. The ‘76 model brought the long awaited B-2lF engine with a quieter and more efficient overhead cam design. The B2lF went unchanged through 1982 and with minor improvements and revisions. The 260 series used an engine known as the PRV or Peugeot, Renault, Volvo. Developed under joint venture by these three manufacturers, it was not well received by the automotive press or Volvo owners. It proved to be a failure in many respects, suffering from poor performance and economy and worse yet, major mechanical failures in the valvetrain. This engine is known as the B-27F and B-28F. There were also a few D24 diesel engine-equipped 200 series available from 1980 to 1984, badged 264GLE or 265GLE. This drivetrain with the engine manufactured by Volkswagen Audi also proved to be unpopular due to poor performance and maintenance costs. 260s in general have poor resale value compared to their 4-cylinder counterparts. Transmission BackgroundIn the 140 and 160 series, three transmission options were available. The standard 4-speed M40(M400 in the 164), 4-speed with electric overdrive M41(M410 in the 164) and the 3-speed automatic BW35. The 200 series utilized similar but updated versions of those used in the 140. The standard trans in the 240 is called an M45, the electric overdrive version an M46 and in 1987 a 5- speed version (M47) was introduced. I never really understood Volvo’s motive in using the electric overdrive versus a true 5-speed. The electric overdrive, necessary wiring and relays can become a bit unreliable as it reaches 100,000 miles. The 3-speed automatic used up to 1981 is the BW55 while ‘82-’93 models used a 3-speed with overdrive known as the AW7O. The manual transmissions are pretty reliable and strong; the automatics work OK, but soak up a lot of power and fuel economy with the exception of the later overdrive AW7O. Volvo manufactured the manual transmissions while the automatics were supplied by Borg-Warner and Aisin-Warner. 700 & 900 Series 1983-1995When the 1983 760 GLE hit these shores, the body style was already dated, many commented that it looked too domestic, a lot like Buick and Oldsmobile models available at the time. Other than a few luxury appointments, there wasn’t much to attract existing Volvo owners away from their solid and reliable 240’s, many preferred the boxy 240 to the “domesticated” 700. Statistical reports of crash data indicated that the 240 was actually safer than the 700/900 series, this reinforced the speculation that the thinner sheet metal in the 700 series body wasn’t as safe or strong as the more robust sheet metal used in the 200 series. Could it be that Volvo had faltered on it’s commitment to Safety? Hardly! The 700 Series was one of the first cars to employ engineered crush zones designed to crumple and absorb the tremendous energies encountered in a crash. Sheet metal became lighter and the integral space cage became incredibly strong, increasing occupant safety. Newer 240 models also utilized this technology.